Mary has over twenty five years of experience in the energy industry having started her career in the UK oil and gas industry. She has been working in the field of sustainable and renewable energy since joining ETSU in 1989. 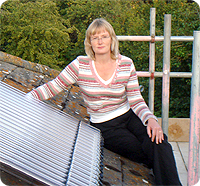 From 1998 to 2004 she worked for ILEX Energy Consulting developing the renewables and carbon trading business. She has extensive experience in the regulatory, policy and commercial aspects of the power generation industry and an in depth understanding of how the exploitation of renewable energy technologies interfaces with the mainstream markets. Project management, working for different clients (various local authorities, housing developers, Utilities, banks and UK government departments). Outside work Mary is still busy with the family even though all three of her sons are pretty grown up. Nevertheless, she finds time to do plenty of sailing and is a qualified Senior Instructor. She is also on the sea staff for the sail training organisation The Discovery Project. She spends time on the river having learnt to row just a couple of years ago and is involved in local initiatives to improve the sustainability of her home town.